← RUNNING IS MY PIZZA! Let’s “jump” back to the ’80s once again, to the time of big hair and big guitars. MTV was in its music video heyday (“The Jersey Shore” was thankfully still decades away) and we all listened to rock music blasting from our boomboxes, on cassette tapes via our Walkmen or on that new crazy format called CDs. The airwaves were alive with the songs from Def Leppard, The Scorpions, AC/DC, Bon Jovi, Queen, U2, Journey… and one of the greatest rock bands ever- Van Halen. Eddie Van Halen wielded the guitar like a master and was supported by Alex Van Halen on drums, Michael Anthony on bass and showman David Lee Roth provided the vocals. The year was 1984 and so was the album. 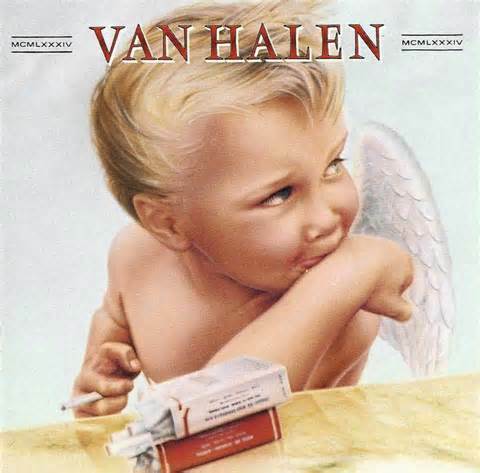 Van Halen’s sixth studio record (the follow up to “Diver Down”), “1984” was the group’s most successful album, selling over 10 million copies in the US and peaking at #2 on the Billboard charts (a little record from Michael Jackson called “Thriller” refused to give up the #1 spot). The song wastes no time in getting you pumped as it starts things off with the keyboard/synthesizer playing the chorus, followed by the drums kicking in hard and then David Lee Roth’s distinctive voice. While the lyrics are far from substantial: “I get up, and nothing gets me down”… that’s about as deep as it gets… the song does know how to get you moving. In addition to playing non-stop on the radio during 1984 (and the rest of the ’80s for that matter) “Jump” became an unofficial sports anthem for numerous teams. As for me, I’ve been a Van Halen fan since “1984” came out (damn, was that really 30 years ago) and also thoroughly enjoyed their “Van Hagar” period. “Jump” reminds me of fun days at the beach, the 1984 Summer Olympics and playing your radio really really loud. No wonder it’s one of those songs that keeps my feet moving over 26.2 miles. Posted on June 27, 2014, in General, Training Tunes and tagged 1984, Diver Down, Jump, MTV, Van Hagar, Van Halen. Bookmark the permalink. 2 Comments. Thanks…I’ve got a couple of those in my running mix pool… “Bring Me to Life” was one of my first songs to run to and Fall Out Boy has more songs on my mix than anyone else (my favorite group to run to). They’ll be popping up on here shortly. And I’ll be checking out your other songs too.